The computer network is a collection of computers, printers and other equipment are connected. Information and data moves through the cables, allowing network users to exchange documents and data, print on the same printer and together using hardware / software that is connected to the network. Each computer, printer or peripherals connected with network called a node. A computer network can have two, tens, thousands or even millions of nodes. A network typically consists of two or more computers that are interconnected among each other and share resources such as CD ROM, Printer, exchange files, or allow it to communicate with each other electronically. Computers are connected, it is possible contact with the media cables, telephone lines, radio waves, satellites, or infrared rays. a. Local Area Network (LAN) / Local Area Network. A LAN is a network that is limited by a relatively small area, generally bounded by the environmental area such as an office in a building, or a school, and usually not far from about 1 km square. Some models of LAN configuration, one computer is usually made in a file server. Which is used to store the software (software) that regulate network activity, or as software that can be used by komputerkomputer connected to the network. 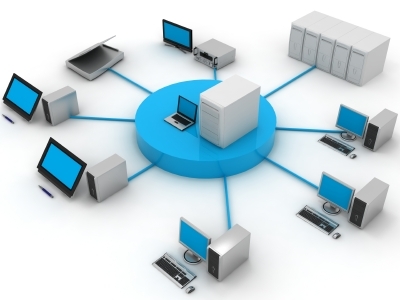 Computers that are connected to the network (network) is usually called a workstation. Usually the workstation capabilities over the bottom of the file server and has other applications in addition to the hard drive for network applications. Most LANs use cable to connect the media between one computer to another computer. A MAN, usually covering a larger area than a LAN, for example between regions within a province. In this case the network to connect multiple pieces of small networks into a larger environmental area, for example as follows: Bank network in which some branches of a bank in a big city is connected to one another. For example, BNI Bank in all areas Surabaya or Ujung Pandang. Wide Area Networks (WAN) are networks that are in scope usually by means of satellite or submarine cable as an example of a whole network BANK BNI in Indonesia or in other countries. Using the WAN facilities, a bank that is in Bandung can contact the branch office in Hong Kong, just a few minutes. WAN usually rather complicated and very complex, using many means to connect the LAN and WAN in Global Communications such as the Internet. But somehow between LAN, MAN and WAN is not much different in some respects, just a different scope of the area is just one among others. A protocol is a set of rules that govern the communications between computers on a network, the rules include guidelines that apply to the ways or methods of accessing a network, physical topology, cable types and speeds of data transfer. Ethernet protocol is by far the most widely used, Ethernet uses an access method called CSMA / CD (Carrier Sense Multiple Access / Collision Detection). This is a system where each computer listens to the cable network before sending anything into it. If the network is clear, the computer will transmit the data, if any other transmission on the cable, the computer will wait and will try to re-transmission if the network is clean. Sometimes, two computers to transmit at the same time, when this happens, each computer will be back and will wait a random chance to retransmit. This method is known to the coalition, and will not affect the transmission speed of the network. Ethernet protocol allows for linear bus, star, or tree. Data can be transmitted over twisted pair cable, coaxial, or fiber optic cable at speeds of 10 Mbps.